House Minority Leader, Nancy Pelosi (R) doesn't hide her displeasure as Benjamin Netanyahu (L) speaks before a joint session of the U.S. Congress. 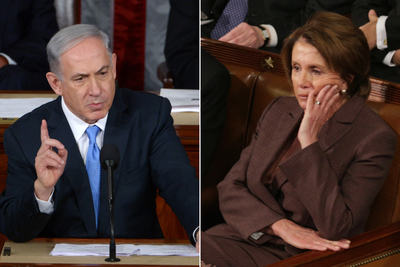 Benjamin Netanyahu's critics were quick to pounce after he delivered his speech to Congress. President Obama asserted that "there was nothing new" and that "the Prime Minister didn't offer any viable alternatives." Senator Dianne Feinstein (D-CA) complained, "He didn't make a suggestion as to what Israel would find agreeable… What he didn't say is what would happen if there is no deal." Upon further reflection days later, she called Netanyahu's move, "humiliating, embarrassing, and very arrogant" on NBC's Meet the Press. Also taking Netanyahu's remarks on Israel's national security needs personally was House Minority Leader, Nancy Pelosi. She made no effort to hide her displeasure during the address and after, she said she "was near tears throughout the Prime Minister's speech—saddened by the insult to the intelligence of the United States… and saddened by the condescension toward our knowledge of the threat posed by Iran." Representative John Yarmuth (D-KY), one of 57 Democrats—and one of six Jews—that boycotted the speech was even more blunt, instructing Israel's leader to "go home." In mainstream media, supporters of Obama's foreign policy rushed to make the President's case and condemn Netanyahu. CNN's Fareed Zakaria suggested that Netanyahu's ideas were based in fantasy. In the New York Times, Thomas Friedman couldn't muster a coherent argument against the substance of Netanyahu's remarks so instead he took issue with Israel's supporters in Congress, "howling in support of a flawed foreign leader," and concluded that having the Israeli leader disagree with the President on the House floor "rubs me the wrong way." In defending its negotiating position with Iran, high-ranking Obama administration officials have employed variations of the line, "no deal is better than a bad deal" dozens of times but they still refuse to make their case based on the merits of their plan. Instead, they've admonished the deal's critics with straw man arguments that military action is the only alternative, by suggesting that any military action would result in Iran's acquisition of nuclear weapons, and by declaring that there's no alternative to their negotiations anyway. This bit of circular logic contradicts itself because it suggests that any deal that avoids military action is a good deal. And since they claim there are no "viable alternatives," it would appear, rather, that any deal is better than no deal—not the other way around. That contradiction is also meant to stifle debate. To that end, President Obama urged Congress to wait to evaluate a nuclear deal with Iran until an agreement is finalized. Of course by then it would already be a fait accompli—which appears to be the point. A healthy bit of skepticism is warranted. After all, without nuclear weapons Iran is the foremost world sponsor of international terrorism with terrorist networks active on five continents. With their recent expansion through terrorist proxies, they now control four Arab capitals in Lebanon, Syria, Iraq, and Yemen. It's true that Netanyahu was very critical of the deal being cooked up in Washington and that much of what he said was a comprehensive repetition, a thorough case against signing a bad deal. But despite the claims to the contrary, the Israeli leader did provide several alternatives: Scrap the "sunset clause" arbitrarily set for some 10 years or at least increase it and make it conditional upon Iranian behavior; work out a verification regime of Iran's compliance that stands a chance of working and; minimize the size and scope of Iran's nuclear program beyond what's currently being considered. Without those changes at a minimum, Netanyahu is correct to say that the current deal under consideration provides Iran with an on-ramp to nuclear weapons. No matter how one feels about Netanyahu's speech to Congress, and despite the attempts to deflect criticism with ad hominem attacks, the Prime Minister raised valid questions that deserve real answers from the White House. It is up to the Obama administration to explain how the deal it intends to sign will actually prevent Iran from getting a nuclear weapon. Such a fundamental reshaping of American foreign policy should require a careful review. That includes Congressional input and hearing from America's closest allies who would be affected most by the deal.